With every Healthy Lifestyle come Two Parts; Good Nutrition and Healthy Exercise. Children have a natural tendency to want to do what is right, they want to be good… they want to be healthy. Teach your children the difference between healthy foods and un-healthy foods. Healthy foods we eat as the main part of our meal and when we do so we get a sweet reward called desert. Healthy eating can be fun and you can be creative teaching your child about healthy eating. Teaching Example: Obtain a modern food chart to show your child (their easy to find you can simply print one off of the internet). When your demonstrating the food chart with your child talk about the different types of food and their benefits i.e. milk makes a body strong and carrots help you see better. Have them tell you what they had for school lunch and what was in each food group. It is important for your child to eat their share of healthy nutrition. Sometimes kids will want to go play or focus on the best part of the meal the desert. It is important to remember that playing and desert are reward for eating healthy. Some parents will see to it that their child eats all of the healthy stuff, which I agree with. What I do not agree with is when the parent sees to it that their child eats the entire desert, which I do not agree with. Remember the desert is an unhealthy reward and if the child doesn’t want to eat their entire desert, and then it is a good thing. 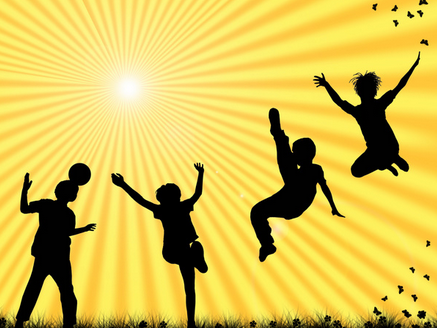 Every city has recreational sports for the kids to get involved in whether it’s dancing, soccer, football or basketball. Get your kids involved and learn how to get along with others while running around and trying to accomplish a team goal. Kids can learn so much by getting involved with others the opportunity of city recreation is endless. There are a lot of activities to get involved in it’s merely impossible to do all of them. As your child gets an opportunity to play a few sports, your child will get a taste of which sport they enjoy playing. Let your child choose the activities they want to get involved in. But as a parent I strongly recommend that you do one thing, when your child is involved in their recreation they will have ups and downs. Just like we have in life it is important not to let your child quit during the middle of the season after the season it is OK. Encourage them with love do not force them. Sonnet, is an associate marriage and family therapist. She is also the creator of Sonni Pets, the therapeutic stuffed animal with a warm heart and a warm belly.